'Good Book 1' (2011), John Wood and Paul Harrison and 'Double O' (2008), Žilvinas Kempinas in Re: work at the Holden Gallery. Photographs: Helena Hunt. When you think of the word rework immediately questions of reuse and repurposing spring to mind, such as how simple objects like a piece of paper can be manipulated countless times to fulfil so many different needs from academic, administrative to creative uses. Re: work at the Holden Gallery explores this very idea but through the use of the preposition re: also opens a theoretical connection with the often hidden act of work that produces such manipulations and re-articulations. Working with three international artists, the exhibition explores their interpretations of reworking everyday objects and the work involved in doing so. With labour and repetition as reoccurring aspects throughout the works in the exhibition, a piece that highlights this is Žilvinas Kempinas’ ‘Double O’ (2008), which will undoubtedly be the piece visitors are drawn to as they enter the gallery, its meditative mechanical hum filling the space. It consists of two industrial fans placed a precise distance apart, with two large magnetic film tape rings caught floating between them in the cross winds. Whilst aware this is due to physics, letting your mind wander and investigating the piece as a momentary wonder of spectacle adds to its fun and engaging nature. 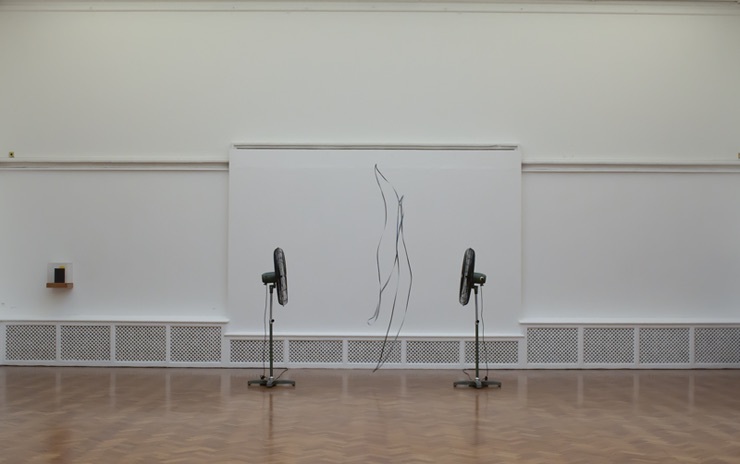 A performative sculpture reminiscent of a choreographed dance, the tapes turn from inanimate to animate, delicately floating and spinning whilst seemingly never repeating the same movement. Moving away from the ephemeral nature of Kempinas’ work Jac Leirner shows possible re-workings of everyday objects that are used in physical production for careers such as architecture and their blueprints. In ‘Metal Wood Black’ (2017) rulers are placed delicately on nails in an organised pattern; from a distance aping the pattern you would see of a voice recording on your phone. Another of Leirner’s pieces ‘Skin (Juicy Jay’s Cotton Candy King Size Slim)’ (2013) involves a rectangular grid of blue cigarette papers, all of which were individually licked and stuck onto the wall, implying a long, delicate and labour intensive process. The intricate patterns Leirner’s work possesses exemplifies the physical aspect of its making, used in artistic careers and other, possibly more mathematical careers. By doing this through her obsession with collecting everyday objects in her pieces, her choice of seemingly mundane items become intriguing and beautiful. The pieces by the artists show the definition of rework and work itself in different ways, bestowing each everyday object used with a new personality in the process. This allows them to become more engaging with viewers, providing them with a personal connection. The exhibition has no need for an in-depth knowledge of the art world, and instead appeals to a large public audience due to the simple yet intriguing nature of the works on display. Following the exhibition, onlookers will now undoubtedly question the labour required or used to create objects, or what would be required of them to rework them themselves, bringing a new beauty and outlook to their everyday lives. Nicole Coyle is an Art History student and writer based in Manchester. Re: work, Holden Gallery, Manchester. 05 November – 19 December 2018.